I would like to invite you to join the 2019 Foundations Program. This is not a woo woo new age practice. This is the real thing—serious, profound, powerful, professional, and very healing. Learn to energy test and correct energetic anomalies in yourself and others. My teacher, Donna Eden, author of the book Energy Medicine (and with her husband, David, she wrote Energies of Love), is gifted with the capacity to see energy in very fine detail. She can see energy in your body. She sees the acupuncture points as points of light. She can see the energy in your organs and she can see the basic Grid (your energetic foundation)—which, as far as we know, few people in the world can see. In these first four classes—called the Foundations Program—you will learn about energy medicine a la Donna Eden. You will learn to “see” through energy testing, what Donna can see with her eyes. It will change your life. You will learn enough in the first four classes—to be held four weekends in 2019 at Ohana Wellness Center, 1892 Greentree Road, Cherry Hill, NJ 08003—to start your own energy medicine practice. Energy medicine augments any other modality. It is significantly different than Reiki, Acupuncture, Pranic Healing, etc. because it addresses the nine energy systems (that Donna has identified) and the synergistic integration of all of those systems. It can be considered Complimentary Alternative Medicine or Integrative Medicine. Energy anomalies are often the cause of “symptoms” that may be difficult to understand in allopathic medicine. From an energetic perspective many of these things make more sense. In these classes you will learn to energy test—an invaluable tool. You will learn to follow the energy. You will learn to become sensitive to energy in general and will recognize “symptoms” of energetic imbalances in yourself and others. You can take this as far as you want. You can work on your friends and family and/or you can become a professional healer and help countless others to find and maintain their energetic balance. The Foundations Program is the first four classes of Eden Energy Medicine training. At your option you may take additional training—a second year (to become a Certified Eden Energy Medicine Practitioner), a third year (Clinical Practitioner) and a fourth year (learning Regression and Grid to become an Advanced Practitioner). And you can do that one year at a time. So, I need to tell you that, while I am very serious about this being professional training, this is ultimately a joyful experience. We have fun learning and practicing energy medicine. As Donna says, if this work does not end up with people feeling joyful then something is wrong. I totally agree. When your energies are balanced you can enjoy being fully yourself! I will encourage you to visit Donna’s website—Innersource.net—and watch some of her videos on YouTube. You can also call or email me and ask me lots of questions or come for an energy medicine session to experience the basics. I have been practicing Eden Energy Medicine (EEM) since 2006 and I want to share this skill, especially through teaching, with those who are serious about learning Energy Medicine. I have had lots of training and experience over the years. I am 67 years old and I have a lot to be passionate about. EEM is central to my practice. And, actually, EEM is central to my life. 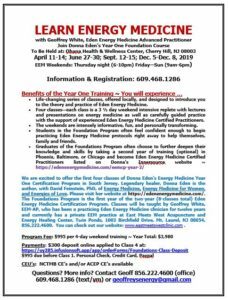 If you are ready for professional energy medicine training I hope you will join us in 2019. I practice EEM locally (for three years) at East Meets West Acupunture and Energy Healing Center, 1002 Birchfield Drive, Mt. Laurel, and I also have an office (for 26 years) in Cranbury, NJ.